Is there an easy way to convert my website to Beaver Builder? The short answer is there's probably no automated tool to convert website content into Beaver Builder, but the solution may still be fairly easy! If you've used other page builders to construct your site, many of them work by adding shortcodes to the WordPress editor. This makes it nearly impossible to easily migrate your content to any other format. In fact, that may be a reason why you're considering or have chosen Beaver Builder. 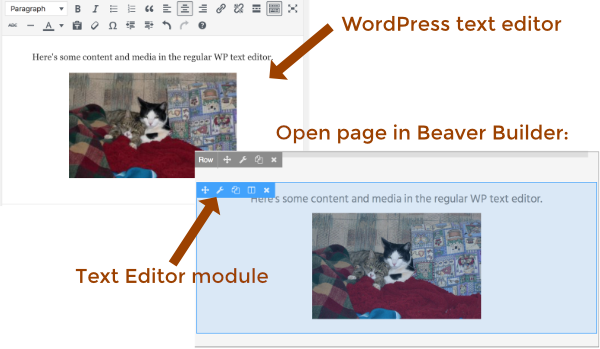 If the old site had pages created using the standard WordPress text editor, the text and media in the WordPress editor will convert to a single Text Editor module when you open it in Beaver Builder, as shown in the following screenshot. That's a start – at least your text is now in a Beaver Builder layout. To get the beautiful layout you're dreaming of, you'll want to break up that content and use it in various modules. For example, you could pull the photo out of the Text Editor module and add it to a Photo module. Or you could use a Callout module instead of a Text module if you want to add a button and links. After you create the modules, you may want to add some custom styling or positioning too either in the module's settings or using custom CSS. We're betting that even if a tool existed, by the time you did the conversion and then the mopping up, you can build a page from scratch even faster. We frequently get feedback from ecstatic new customers at how quickly they are able to get up to speed and create pages and websites from scratch in record time. Displaying your old website pages in HTML and copying content chunks over into Beaver Builder modules is quite possibly the most efficient way to go about it. Remember, if you ever deactivate the Beaver Builder plugin, your text and images are preserved in the WordPress text editor, minus layouts and style.